R12 Charities receives donations from individuals, corporations, foundations, and other non-profit organizations. Donations may be sent through the mail or contributed online. R12C receives clients from a network of local poverty-alleviation agencies. These clients must be currently involved in a deliberate and directed program with the goal of exiting poverty soon. R12C's goal is to decrease client stress as it pertains to automobile maintenance so that they can pursue, with minimal distraction, their goal of attaining family and financial health. An R12C representative will meet with the screened client, verify the automotive need, and determine the best course of action. 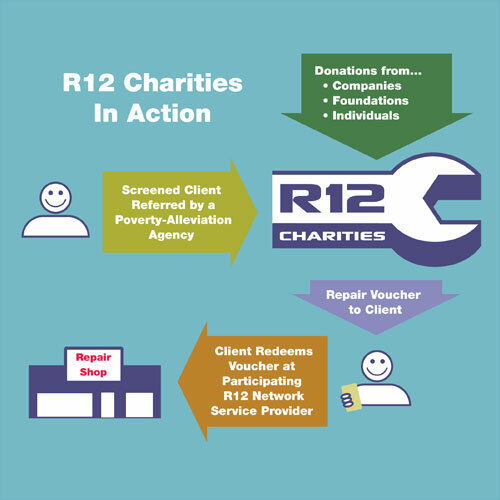 R12C maintains relationships with a network of automotive service providers that have agreed to provide repair and maintenance service to clients presenting a properly authorized repair voucher.